May Hands was born in 1990 in Brighton, UK. Fascinated by the urban landscape she puts elements and objects she casually encounters into a new light, lending them – with her very personal language – a light, but never destructive, new dignity. 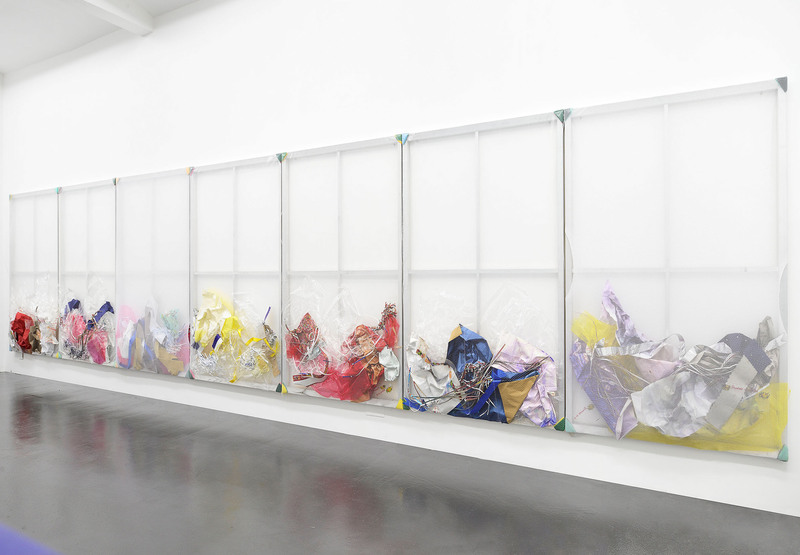 The following conversation aims to understand her practice, her process and how her work is characterized critically. 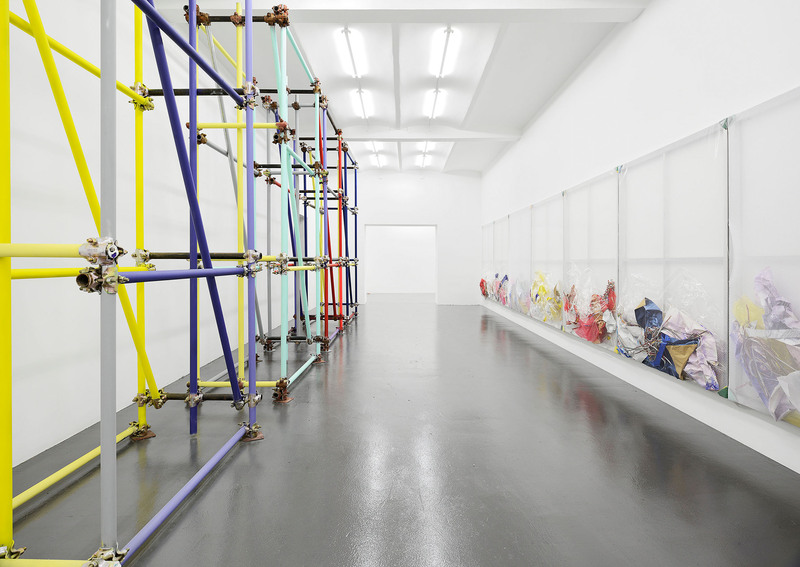 Vincenzo Della Corte: Let’s start by talking about the installation that we talked about at Vienna Contemporary. A part of it reminded me of my childhood, the fruit markets I used to see in the centre of Naples. Could you explain the concept behind the installation? May Hands: Raschelsäcke, the German term for the type of netting storage bag, or sack, that is used to stock and display fruits and vegetables is the base structure for the sculptures that were on show in Vienna. These bags can be found in greengrocers in all cities. Typically, they are stacked and displayed on the floor, or hung on the wall by a hook, and sealed by stitching. But when opened to reveal their contents they could appear to be a kind of treasure trove – a ‘feast for the eyes’ as well as inviting the shopper to pick out the colourful and delicious contents. The bags might be just as special as the contents in the sense that without the materiality and the rich visual qualities of the presentation (the sacks), the whole shopping performance of choosing and selecting would be incomplete. The artworks in the installation are decoratively embellished with embroidered fruits, vegetables and text, changing their function and appearance. They are filled with shredded plastic, papers and fibres, so there is a sense of fullness and form for sculptural impact as well as giving a sense of the abundance of goods. I felt that the artworks should reference something from their original setting, but as they have to be presented in what is usually a white cube surrounding, I could at least use features of the fruit and veg store. Whether simply placed on the floor, slouched against each other, or placed on plastic crates, as if on a traditional plinth or pedestal for a sculpture. Alternatively, these works can be suspended on hooks with rope, their contents spooling out – something I have seen regularly in the stores of Napoli. VDC: Looking at Freschissimi, your ongoing exhibition at T293 in Rome, it seems that the typical lightness of your work (the use of soft, bright colour) is still there. But newer rough elements have been introduced. It seems like it’s the first time you’ve introduced materials like cement and steel in your work. Could you talk about the exhibition concept and why you chose that title? MH: Consumerism has always influenced me, which is where I found the light airy colours, yet most recently in looking at the streets and markets stalls I wanted to expand my references to the surrounding physical context. I have been influenced and informed by walking through city centres and being presented with a variety of materials, colour, patterns, compositions and spaces. But, in addition to the obvious commercial elements and features that are designed to attract attention these places are often dirty, not perfect and clean like we see in advertising imagery or a designer shop window. There is grit, grime, erosion and greyness alongside freshness, perfection and pleasant colours. Noticing, say, the damaged guttering, the weathered surfaces, the discarded junk and detritus provide a kind of framework to the glamour – any notion of a Utopia has an element of Dystopia. Plaster, cement and steel I have introduced to my palette of materials because the materials of the built environment, and its construction, are now influencing the forms I am making. For example, scaffolding is ubiquitous in the commercial environment, either where buildings are being fixed or newly built. 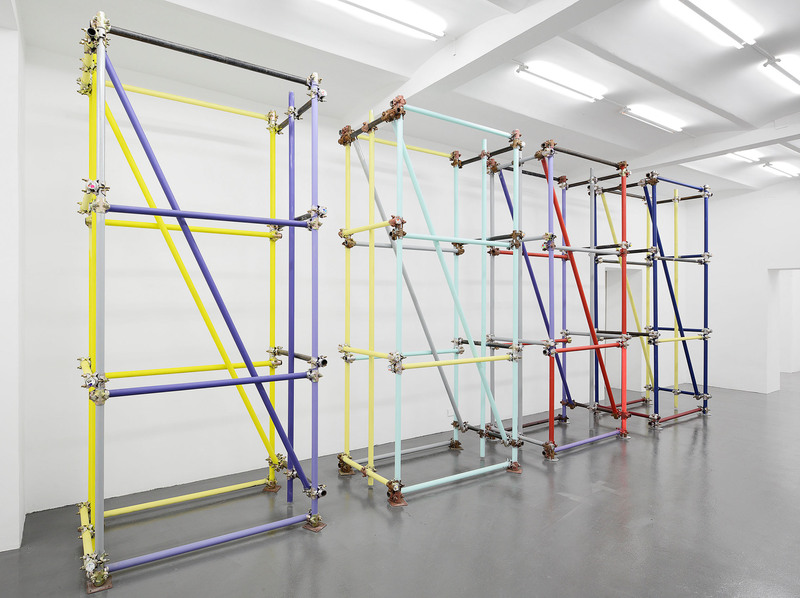 In the show at T293 I wanted a kind of conversation to evolve between the painted scaffolding construction that stands on the floor and the mixed media paintings displayed opposite, on the wall. As for the choice of title for the show, I often choose titles from what I can read off the packaging within the work. ‘Freschissimi’ is repeatedly printed over a food packaging paper which appears in both paintings and buckets in the show. I enjoy the sound of the word when spoken and how you move your tongue and mouth to pronounce it. It is an Italian word and as all the work has been freshly made here in Italy for this exhibition it fits perfectly. VDC: When talking about your practice, you mentioned to me that often, while walking on the street, you look at some element that catches your attention and you need to put it into your work, also with the intention to draw other people’s attention to that element/object/combination. Being amongst the crowd of an art fair, I am not sure I understood correctly exactly what you meant. Would you be willing to clarify or to talk a bit further about that? MH: Like many others, I’m sure; I notice interesting compositions and juxtapositions of objects in all kinds of environments. But my modus operandi as an artist is to incorporate and exploit what I find around me. We can all relate to those walks in the countryside, or along the seashore, where someone will stop and say, “look at this” – but this is equally possible in a commercialised, urban space. The material qualities and associations of urban leftovers, such as litter or packaging, can prompt the imagination and kind of magnify the space. For example, the chance encounter of finding fruit peel discarded on the pavement, its organic shape framed within the rectangle of the pavement slab looking like a brush mark, suggests a painting. Or shiny, metallic confetti from a wedding celebration, scattered amongst fallen leaves, reflects the sunlight and is blown around by passing cars giving a sense of being alive as it’s kinetic and tactile. What usually goes unnoticed by many of us can hold so much content, so I like to claim these materials and retrieve them from one context and bring into my own, initially in the studio and later in the gallery space. Presenting these small or seemingly innocuous and unimportant moments and giving them value, a kind of authority, to an audience motivates me endlessly. I like to show the viewer how I perceive the world. To me these small moments have so much worth, like gold or oil – but constituting a richness of value for all. The communication in the artwork is about sharing something, a celebration. VDC: Mimesis and metamorphosis. How present and relevant are these two concepts in your work? MH: Metamorphosis is very relevant, changing an object or material ‘magically’ into something new, showing no apparent effort or difficulty. For example, the assemblage/paintings contents can be viewed as brush marks and areas of colour making a composition. Contexts for materials are changed too, so discarded ‘rubbish’ and wrappings become precious art materials. Mimesis is relevant too as I am interpreting and mimicking objects through certain methods, processes and other materials. For example, a painting made with alternative and unconventional art materials, as I have stated above, or the internal cast of a bucket to reference a useful domestic item. But, from a conceptual angle, I want the mimesis to be transformative rather than just mirroring or stating the obvious. VDC: Compositionally, your canvases contain elements and material in the bottom half. Looking at them, one spontaneously thinks of gravity and accumulation. Could you elaborate on that idea in relation to your work? MH: Gravity is actual and implicit. On a formal level, and in terms of decision-making for the final outcome, I find that when paintings are placed on the floor (especially in the studio) and are elevated by bricks or some other devise, the paintings play with gravity and force a physical tension between wall, floor and viewer. There’s also a contradiction implied by the physical presence and size of the artwork and the actual weight of relatively light materials. 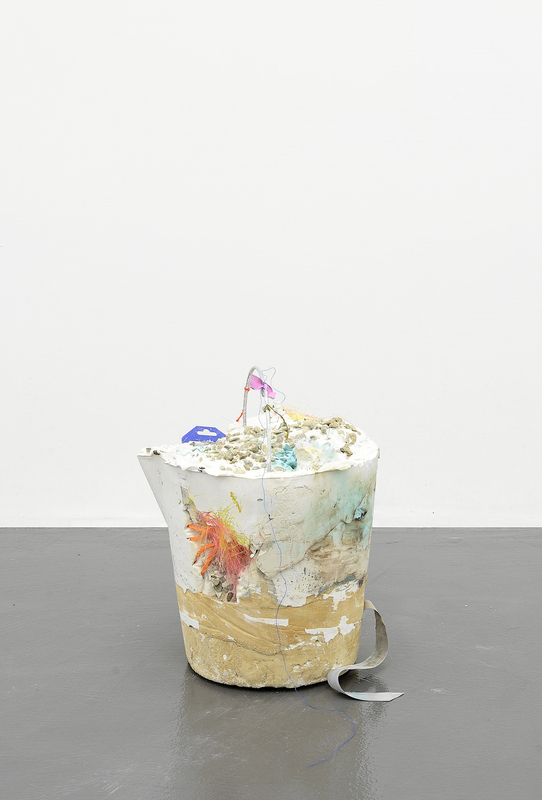 The recent bucket-forms, though small, are very heavy as they are so dense with materials such as plaster and cement and rest on the floor as found objects. They are mostly white in colouration and therefore look quite light. The added materials, including shreds of paper and plastic bags, appear frozen in the ice-like form and have a sense of floating. Perception, without physical engagement, can be misleading, as they are almost too heavy to pick up. The implicit playfulness of assemblage and mixed readings can be countered with ideas about the purpose of art (more objects in the world) and environmental and materialistic issues that impact on our lives, which adds a moral gravity. 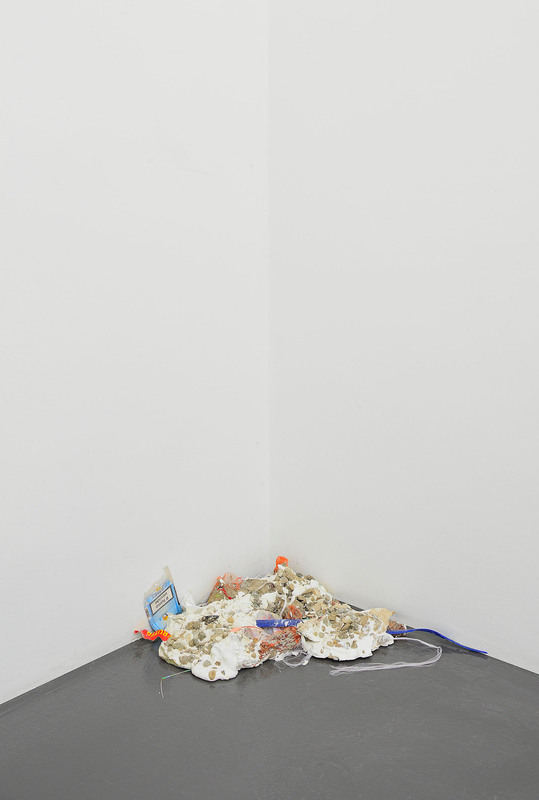 Accumulation and disposal are typical positive and negative aspects of our world today and the ‘bellies’ of the paintings that characteristically bulge and are contained by netting or plastic sheeting reference this. They are formed from a combination of ingredients, often directly taken from bags of materials that I have collected. They also reference bags of waste packing seen in the street, where plastic and cardboard are prevalent. There’s an environmental issue here of course, but materialism as both a human pleasure and as being problematic is implied too. The bellies might also suggest fecundity and richness, or, conversely, waste to be excreted. It’s easy to get carried away with interpretations, but there is space for the viewer to interpret as they wish. VDC: If I take a cell phone and put it on a golf club, the cell phone loses its function and status and together with the golf club becomes something else. On a different note, if I take an aluminium sheet, and I put some sort of chemical element on it – because I want it to look like a piece of marble – I need a much more complex and long lasting process. In relation to your practice: you take an element and you elevate it to a higher (or just different) status. Is this interpretation of your process correct? If yes, to what extent is your work about process? MH: Yes, that’s a fair interpretation. As I said earlier, by elevating the humble or discarded material a kind of magical transformation can take place. In re-presenting materials, supported by referencing real experiences of the world (e.g. my High Street walks), one can stabilize the aesthetic, financial and cultural values that might be implicit to the viewer. Bringing all ingredients (e.g. expensive aluminium frames and discarded wrapping paper) to this same level of importance in the work creates one unique value. This ‘value’ may not need to be measured in hierarchical terms for making art with elevated materials; I guess that reflects my position or a manifesto point, but I want a response (from myself and the viewer) that is based on experiencing the work for what it is and without pre-conceived notions of materials-value. But, I suppose by noticing, and therefore critiquing ‘things in the world’, one is projecting a value of sorts. This finding, valuing and transforming of materials is part of my working and thinking process, it informs the making of process and method. Process of course is incredibly important to me; it starts from the beginning and continues to the completion on an equal footing with ‘conceptual’ development. My art education from the earliest age instilled this in me – the process of thinking, seeing and making whist working with all sorts of materials. VDC: To what degree is your work a critique of capitalism? Should art have a social function? MH: No, it is not a critique as such; however contemporary art is always linked to the surrounding financial conditions in society. Within my work there is some response to the commerce-lead world we live in, which has a dominant capitalist economy, so I suppose there is at least a referencing of capitalism. I am not consciously critiquing capitalism, but rather critiquing values and materials in the greater, global, society around me. This culture happens to be predominantly capitalistic, but I am not saying things are good or bad; rather, it’s a combination of these two aspects: the value of ‘things’ and a relationship to forms and materials and what they can represent or mean for us in terms of value. As for art having a social function; it is not a question of should it have a social function, it does, as an aspect of culture. The visual arts have many functions within the realms of both public art and private art. A meaningful social function might be to prompt the viewer to think about and question their pre-conceptions about any subject – but I would feel uncomfortable about a didactic purpose for art. I like the idea that everyone can enrich their lives with art, whether they visit exhibitions, make it themselves or acquire it from artists. VDC: As mentioned above, your practice is very much “organically” characterized, based on the materiality of things, objects, elements, urban leftovers etc. Could we say, therefore, that it is not deeply indebted to the Internet? What is your relation with Internet? How does it flow into your work? MH: The Internet is now such a major part of our lives and cultural ecosystem, to say that my work is not at all indebted to it would be mistaken. The Internet saturates our information and image environment and I am of the generation that has now been nurtured by it. My work responds to my environment and, though I make real ‘things’, objects you can touch and hold, the Internet is always at least there in the background and I am aware that images of my artwork will inevitably become digitized through photography and distributed on-line. Like everyone else I use the Internet for research – but I make sure that I read books and get to exhibitions to see original works of art. The flatness of the digital interface is too limiting. If I wanted, I could apply a similar thinking and assemblage method from the many elements of the Internet as I do with the materials I find, but could we hold and experience it in a satisfying, non-virtual way? Would it have the same autonomous presence as an object or painting? You cannot touch the Internet, though it’s more than just ‘virtual’ or ‘hyperreal’, and you can acquire just about anything, goods and services, with a few a few clicks. It’s an amazing portal that can send back things you can buy, or allow you to fantasize about owning. But it is fundamentally invisible, an invisible substance, like air, it’s everywhere yet one is not able to hold and understand through touch and inspection. Perhaps the digital is essentially selling information rather than objects, as with music or image files: but they are flat and lack depth and texture. It’s both scary and exciting at the same time. VDC: You live in London, a city that artistically is very particularly structured, and you have been living for short periods and working in Naples, Rome and Bergamo. How do you perceive the Italian art system? MH: ‘Passionate’, is the word that comes to me when I think of the Italian art system. The collectors really care about and love art. They want to know and learn more about the work; to listen to artists and find beauty in their creative output. London’s art system feels different, though profound interest is still there, it’s less about beauty and passion and more about concept and trend. I could be misreading it though. Being typically English I have romanticised the Italian way of life, their language and emotion. Returning to London after three months I wonder if everything will seem more serious, emotionally colder and less rich and adoring perhaps? I will find out. VDC: What are some of your upcoming projects? MH: Having just returned to London after the summer months in Italy where I had two solo exhibitions with T293 and BACO, plus the series of editions made with LRRH_ in Berlin, it’s time to reflect on all of this experience. With some geographical distance, as well as time, this provides some useful perspective. Also, I am about to move into a new studio and will settle back into a routine. Being away in different cities has meant that I have sourced many new collage materials and generated various ideas for future works. I am excited to research further into the so-called ‘expanded field’ of painting that, in my case, is becoming sculptural, and to push my own boundaries.